A summer BBQ is not necessarily just a meaty enjoyment. 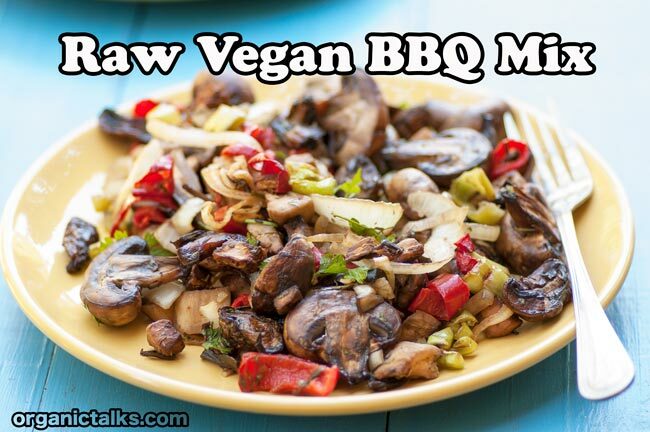 I’ve prepared a Raw Vegan BBQ Mix which is equally popular with vegetarians and meat eaters. So for those of us who love to socialize, picnic or perhaps are invited to a friend’s BBQ or potluck and still want to eat fresh raw foods – here’s the solution. 1. Chop champignons, red peppers, onions, parsley, and eggplant into smaller pieces. 2. Put all ingredients into a bowl and mix well. 3. Let it sit for about 60 min. or overnight. 4. Scatter all onto dehydrator sheets. 5. Dehydrate at 115ºF (46ºC) for 4 hours.